1.Check whether the pump and pulley have wear and damage, if necessary, should be replaced. Check whether the pump shaft is bend and whether the journal wear and shaft thread is damaged. 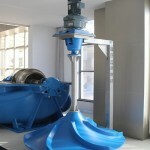 Check whether the blade on the impeller is broken and whether shaft hole wear is serious. Check the degree of wear of the water seal and the bakelite washer, such as exceeding the use limit. Check the bearing wear, the table can be used to measure the bearing clearance, such as more than 0.10mm should replace the new bearings. 2.When the submersible pump removed, broke down it in order. After the decomposition of parts should be cleaned, and then check one by one to see if there are cracks, damage and wear defects, such as serious defects should be replaced. 3.Water seal and seat repair: water seal, such as wear from the slot, can be used abrasive wear, such as wear and tear should be replaced; water seal seat if rough scratches, can be used flat reamer or repair in the lathe. Replacement of new water seal assembly during overhaul. 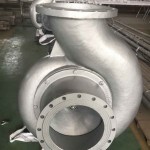 4.When the pump with the following damage, it allowed to repair: the length of 30mm or less, does not extend to the bearing hole hole cracks; and the cylinder head to connect the flange has broken parts; oil seal hole damage. Water pump shaft bending should not exceed 0.05mm should be replaced. Impeller blade damage should be replaced. Water pump shaft wear should be seriously replaced or set of repair. 5.Check whether the pump bearings are flexible or has abnormal sound rotation, if the bearing has a problem, it should be replaced. 6.When the pump is assembled, turn with hand, the pump shaft should be without stuck, impeller and pump shell should be without rubbing. And then check the pump displacement, if any problems, should check the reasons and exclude. If the pump fails, the coolant will not reach the corresponding place, its performance will not be effective play, and ultimately affect the work of the engine. Therefore, it is necessary to strengthen the inspection of the pump. What are the advantages of submersible pump?